A complete composite of all of my work over the last 2 decade’s installations, performances, special projects and multi-media sculpture (interactive projects not included). for a large-scale interactive, immersive experience. 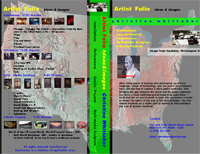 Passage3 (3rd version) is a video demonstration of 10 video composite files of images and sound. The composite and frequency of the video would contribute to hypnotic states in the viewer participant of which I hope to achieve even a greater state in the large-scale interactive, immersive experience + PUI interface. demo for a large-scale interactive, immersive experience. 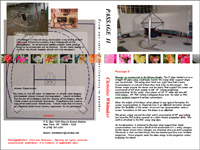 Passage2 (2rd version) is a video demonstration of Passage2 and how it works. Passage2 is the large-scale interactive, immersive experience where the user is supported by a California tree chair. The main 4’ structural pole supports a PUI interface that controls the movement of the video being projected on the 18’ ellipsoidal screen. Concept in 1996, Construction started in 2004 while both an fellow of Mark di Suvero and NYU ITP. demo from the interactive, immersive experience. Passage1 (1st version) was originally a prototype for "Real World Barcelona" a Laurie Anderson, Peter Gabriel and Brian Eno project it was composed of a suspended audio swing chair (that detected sound at –65 decibels making the participant the soundtrack), amplifier, headphones, video deck and two video monitors (ran video at two different frequencies). The later section of the video is dedicated to user feedback.